Ooma, Inc., a smart communications platform for businesses and consumers, announced today that – for the fifth year in a row – the company’s Ooma Office service has won PCMag’s prestigious Business Choice Award for Best VoIP Solution. 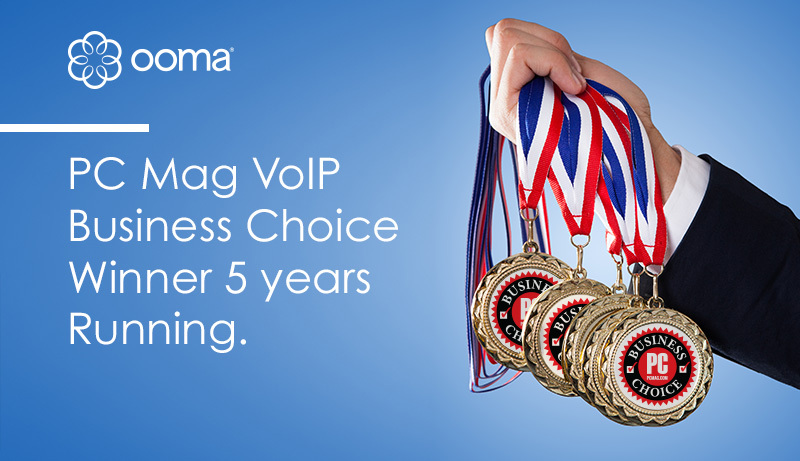 The award (https://www.pcmag.com/news/359660/business-choice-awards-2018-voice-over-ip-voip-systems) is part of the magazine’s annual Reader’s Choice Survey, and Ooma once again came out on top among 14 finalists, including Vonage, RingCentral, Google Voice, Comcast, Skype, Verizon and Avaya. Ooma Office (ca.ooma.com/small-business-phone-systems/) is an affordable, flexible and scalable cloud-based communications platform. No service contracts are required with Ooma Office, and the system works with a company’s existing analog phones and fax machines, as well as Ooma-provisioned IP phones. The Ooma Office for Mobile app keeps workers fully connected when away from their desks, while advanced features such as a virtual receptionist and ring groups keep businesses from missing customer calls. Ooma (NYSE: OOMA) creates powerful connected experiences for businesses and consumers, delivered from its smart cloud-based SaaS platform. For businesses of all sizes, Ooma provides advanced voice and collaboration features that are flexible and scalable. For consumers, Ooma provides PureVoice HD voice quality, advanced functionality and integration with their mobile devices. Ooma’s groundbreaking home security solution delivers a full range of wireless security sensors and a smart video camera that put consumers in charge of protecting their homes. Learn more at ca.ooma.com. The Ooma Office business phone service does not include high-speed Internet or broadband service. Rates do not include federal universal service charges, state and local taxes, fees & surcharges and regulatory and compliance fees. Additional extensions may require a monthly service fee or purchase of peripheral devices sold separately and requires sufficient bandwidth on your high-speed Internet connection. Transfer of your existing phone number is not available in all locations. Unlimited Canadian calls are subject to normal residential usage limitations. See terms and conditions for current usage limitations. International calls are billed per minute and must be prepaid. Directory assistance (411) calls are billed per call. See rates. Ooma E911 service operates differently from non-Internet 911 service. See 911 for details. Some alarms, faxes and other devices may not be compatible. Additional terms apply, see terms and conditions. Any questions? Call us (free, of course). Call 866.452.6662. You are navigating away from ca.ooma.com. An Ooma Office Sales Representative will be in touch shortly. Upgrade to a smart business phone for only CDN$ 24.95 per user/mo.